Students at Fordham University have sued the school for refusing to recognize a pro-Palestinian group. FORDHAM — Fordham University suppressed a group of pro-Palestinian students' right to organize because administrators feared it would polarize the campus, according to a new lawsuit. The group, Students for Justice, whose stated mission "for the promotion of justice, human rights, liberation and self-determination for the indigenous Palestinian people," applied for university recognition on Nov. 19, 2016, according to the suit filed in Manhattan Supreme Court on Wednesday. The college's Dean of Students Keith Eldredge told the four undergraduate students, including Ahmad Awad, that he was concerned that the group would be controversial. The group was later approved by Fordham's United Student Government on Nov. 17, which emphasized that supporting diverse viewpoints is aligned with the mission of the university. However, Eldredge then told Awad and other students that he needed to review this decision before it was finalized and met with them on Dec. 12, where he asked them whether they supported the movement to boycott, divest from and sanction Israel, as well as whether they would describe the country using the term "apartheid," according to the suit. Students said that they defended the boycott, divestment and sanctions movement and offered examples of laws in Israel that they maintained were akin to apartheid. Eldredge ultimately wrote a letter to the students on Dec. 22 denying approval of their group, saying he could not support an organization that advocated the political goals of one specific group against one specific country. "There is perhaps no more complex topic than the Israeli-Palestinian conflict, and it is a topic that often leads to polarization rather than dialogue," Eldredge wrote, according to the suit. "The purpose of the organization as stated in the proposed club constitution points toward that polarization." Awad said in an affidavit that he felt "disgusted" by this decision. "For nearly four years I had heard Fordham administrators speak about Jesuit values, about creating moral people, being kind and taking care of those less fortunate," he said. "When I received this decision, I understood this message did not apply to Palestinians. I felt defeated." The lawsuit claims that Fordham has never before overruled a decision by the student government to approve a club or denied approval to a club because it would be polarizing and maintains that the decision was at least partially based on faculty members' disagreement with the group's viewpoint. The students demand in the lawsuit that Fordham officially recognize Students for Justice in Palestine and admit that the university violated its own policies when it overruled the student government's approval of the club. A Fordham spokeswoman, Gina Vergel, said the decision to not recognize Students for Justice in Palestine was based on the behavior of the national organization, according to a statement, and that they will grant status to the club if the students slightly alter its constitution. "The students can have the discourse that they seek on this issue in the form of a student club, the club they sought in the constitution," Vergel said. "The University, however, is simply asking that the name of the club and the proposed constitution be changed to more accurately reflect the lack of control by the national organization or chapters of SJP, which the students have already represented to be the case." 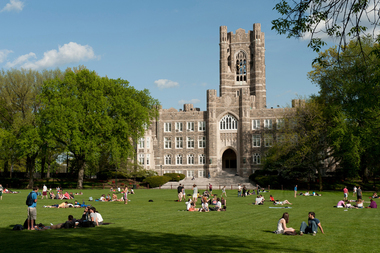 Fordham senior Sapphira Lurie, a plaintiff in the case along with Awad and students Sofia Dadap and Julie Norris, dismissed this proposal by the university, saying that the administration never made it clear that such measures would lead to the club’s approval and that members were not interested in changing its name. "The name Students for Justice in Palestine is very important to us,” she said, “and we don’t want to sacrifice that just for the political whims of a top few administrators when we have student support for a club of that name."